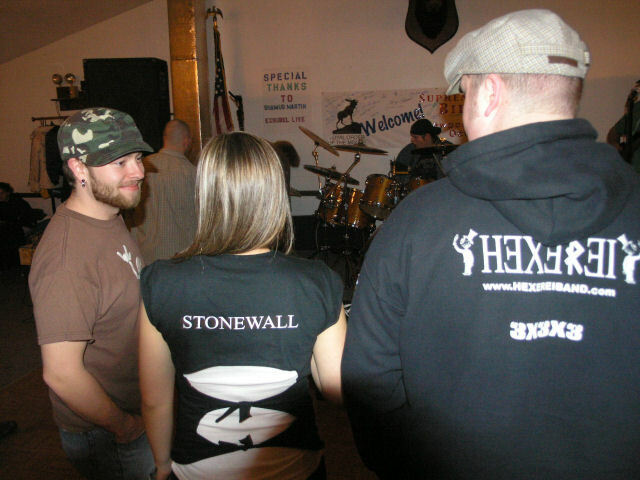 Stonewall presents an energetic hybrid of metal and melody. Live, they are one of the hardest rocking outfits around. For many years, the were quite literally the band to beat, as several “battle of the bands” contestants left in their musical dust could well attest. If they’re reminiscent of anyone, it’s bands whose heyday came long before anyone in the band was born. The James Gang, Mountain and Three Man Army – the youngsters in Stonewall may not know these relics by name, but be assured their spirit lives in their music. “What If?” was several years in the making, but Stonewall reportedly has new songs in the works. Hopefully, a follow-up won’t take so long. Friday, Oct. 16 – Blue Shamrock, Lowell, Mass. Over the last four-plus years, Stonewall’s live shows earned them a reputation as one of the hardest rocking outfits around. They are quite literally the band to beat, as several “battle of the bands” contestants left in their musical dust can well attest. But it’s taken until now for Stonewall to commit their energetic hybrid of metal and melody to disc. Solid from start to finish, “What If?” was definitely worth the wait. The fuzz-toned opener, “Blessing For Pearls,” rips a page from Zeppelin and blends it with post-millennial angst. “Janitor Man” will invite Alice in Chains comparisons – deservedly so. 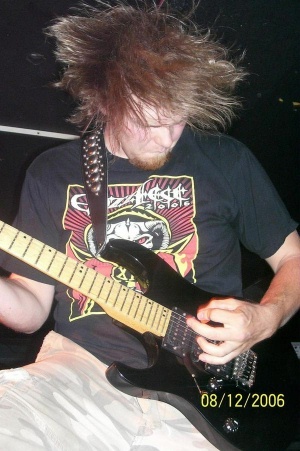 Lead guitarist and vocalist Josh Parker’s baritone hovers just above a growl. “Vengeance” is a good example of Stonewall’s hard-edged melodic style. The 8-minute track begins in a flurry of heavy metal bullets. It then crosses over a polyrhythmic structure featuring a few speedy guitar figures from Parker, before settling into a blistering boogie. Make no mistake, while most of the record rocks, it’s never buried in sturm und drang. This thematically dark “Masculincense” (Parker may have wrote it after a night of old Nine Inch Nails videos) churns and roils, then ends with a tasty blues progression. “Comatoasted” is reminiscent of Primus, another 90’s power trio. It’s a ride that starts slow and turns into a runaway train. “Your Sweet Intents” achieves the same energy, showcasing Ryan Young’s staccato drumming and featuring one of Parker’s meatiest solos. Young and six-string bassist Philip Chiu are a brawny rhythm section throughout, but the duo also bring a gentle touch to the record’s quieter moments. These include the Stone Temple Pilots dead ringer “Grain,” with Parker majestically soloing at song’s end. The snarky power ballad “Straight White Teeth,” a Stonewall live staple for about as long as they’ve been playing, makes the move from stage to studio with aplomb. Speaking of Stonewall standards, it’s a mystery why the punched-up rocker “Hearing Loss” didn’t make it on to “What If?” Maybe the band is saving it for a future EP. It’s essential to note the production team that shepherded “What If?” through its’ nearly two year journey to completion. Early on, Shamus Martin worked with the band at Exsubel Studios, mixing them and helping them find a polished studio sound without sacrificing their live edge. The production credit, however, goes to the late Doug Bashaw. Committing a power trio to tape – or these days, digital bits – can be a delicate balancing act. Bashaw added enough studio magic – guitar bags, phased vocals, SFX – to make the record more than simply a document of a great live band, but not at the expense of Stonewall’s essence. Under proposals published Feb. 13, the Federal Communications Commission would require television and radio station owners to reconnect with their markets at a time when technology allows remote broadcasting and shared programming. The industry doesn’t like the idea. How broadcasters serve the public interest in exchange for free use of public airwaves has been debated for decades. The stakes have increased as media consolidation and technology have allowed stations to operate without a local presence and with ownership far away. The FCC said it was rethinking its past reliance on “market forces” to decide programming. The NAB wonders why cable and satellite television companies aren’t being similarly pressured. I don’t think they have much to worry about. Remember the Michael Powell road show back in 2003, when thousands of citizens lined up to complain about everything from disappearing farm reports, a dearth of local news and, most famously, tornado warnings going unreported because no humans were around to answer the “local” station’s phone? People had their chance to vent; after that, nothing happened. It’s been five years, and the best the FCC can come up with is pablum about “better serving local communities”? That train left the station in the early 1980s, with the repeal of the Fairness Doctrine. The so-called public airwaves are now governed by the Golden Rule: he who has the gold, rules. Also under consideration is whether stations should set up and consult local advisory boards to determine “significant community needs” and whether radio playlists exclude local artists. Comments are due April 28. If the FCC passes this, does it mean I can force Q-106 to play Stonewall’s new record? I’m not holding my breath. It’s with sadness I note the passing of Andy Dickinson, the young man from Newport paralyzed last November in a motorcycle accident. Andy died last weekend from complications associated with the accident. He had a lot of great friends and family, and the benefit show for him at Newport’s Moose Hall last February was a memorable night. The local music scene will miss him. Shoeless Joe Jackson and Ty Cobb likely won’t materialize from the cornfields, but the day promises its’ share of magic. Some of the area’s best bands will perform a show that starts at 11 AM and runs past dark. Tickets are a bargain at $10 ($15 at the door). It’s all for a good cause, too – the just-formed Ludlow Recreation Camp Fund, a charity that helps kids who can’t afford to go to summer camp. In a way, it provides them with their own field of dreams. The management at Christopher’s hatched the idea of an all-day festival as a way to give performers who play the Ludlow club a wider audience. Soon, their ambitions grew. In typical fashion, the local music scene coalesced around the effort. Everyone’s playing for free Saturday to give the fund an initial infusion of capital. 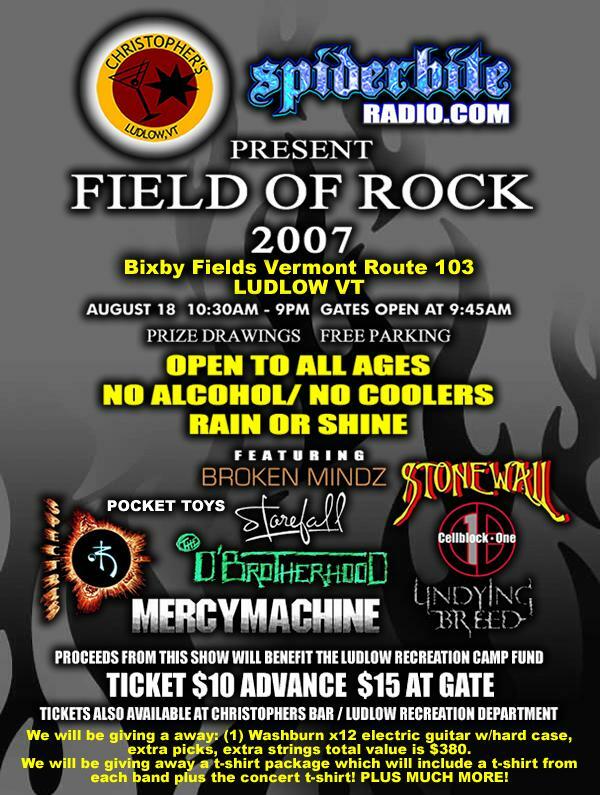 The eclectic musical lineup leans towards hard rock, with Stonewall, Starefall and Broken Mindz, and edgier metal, with Cellblock One and Undying Breed. 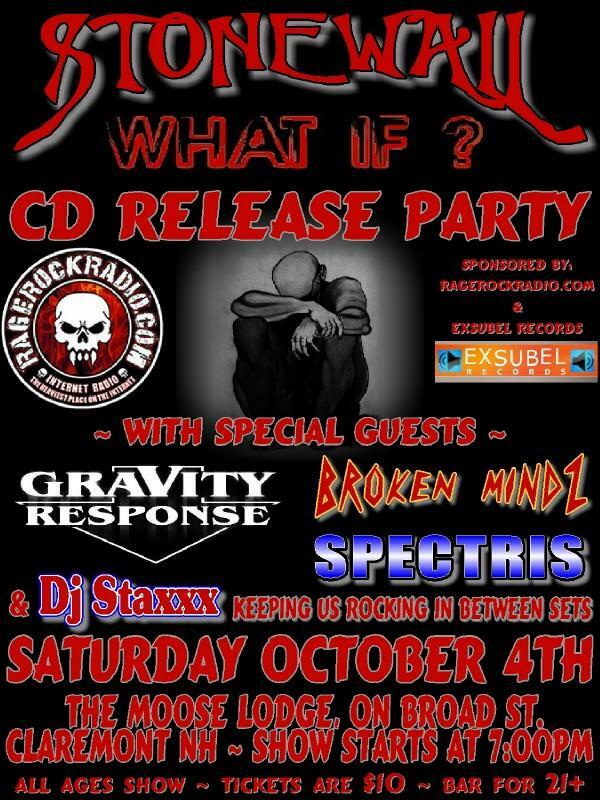 But prog-rockers Spectris will spice up the mix, and one of my favorite groups, rage rappers The D’Brotherhood, should also liven things up. Rounding out the all-ages event are Haili, Pocket Toys, and Mercy Machine. As if a great day of rock weren’t enough, the promoters (Christopher’s Bar, SpiderBiteRadio.com and 99 Rock) are also giving away prizes, including a very cool Washburn guitar package. Thursday: Putnam & Pirozzoli, Sophie & Zeke’s – Gerry and Tom have known each other for years, but didn’t get around to making a record until this year. The CD, “Conversation Without Words,” has elements of bossa nova and free form jazz, but also includes tunes from the likes of Gershwin and Bach. What’s most distinctive is the way the two mesh musically, as smooth as coffee and cream. Friday: Who Are the Brain Police, Seven Barrels – I’ll admit I don’t have much first hand information about this ensemble. There are four or five guys, and they play rock, I guess. But their moniker implies an affinity for Frank Zappa, one of my favorites. Plus, two members of the band used to belong to an group called the Shaven Ape Babies. So, I’m willing to recommend them for their inventive approach to band names. Saturday: Gully Boys, Middle Earth Music Hall – Local impresario Chris Jones turns fifty for the fifth time, and his friends in music conspire to give him a bash. Chris is still fighting the good fight and keeping the music alive in the Shire. He’s hoping some of the upcoming shows, including Steve Forbert next Thursday, draw well so he can buy a new heating system. You can read more about that on the club’s web page, memh.com. Sunday: Cornish Fair – The final day of this venerable fair begins with an inspirational morning set from Gospel Train, with support from the Plourd Family Quartet. The rest of the day includes magic (Conjuring Carroll), kid’s music (Bill Shontz’s Teddy Bear Picnic) and country (Maria Rose & Danny Elswick). Of course, there are also horses, goats and funny dogs – seriously. Raul Castano’s Comedy Dogs strut their stuff at 2:30. Tuesday: Ensemble Zora, Metropolis Wine Bar (Brattleboro) – A new-to-me venue welcomes a quartet of singers who were inspired by a visit to Bosnia last year. They perform village music, dance songs and the urban Muslim music of Bosnia, Croatia, Serbia and Macedonia. They’re joined by Miamon Miller on fiddle and Chuck Corman on bass and dumbek (a goblet-shaped instrument also known as a chalice drum). Wednesday: Wynton Marsalis Quintet, Iron Horse – The ambassador of American jazz stops in Northampton for four intimate shows – two each on Tuesday and Wednesday. These dates were postponed when sax player Wes Anderson took ill, but they’re un-cancelled now. Marsalis leads things on trumpet, with Dan Nimmer playing piano, Carlos Henriquez on bass, Walter Blanding Jr. taking over for Anderson on saxophone and Ali Jackson at the drums. A couple of months ago, the Upper Valley music scene’s ubiquity dimmed a bit when Shenanigans switched to a “house band” live music format. The nightclub, located next to the Astrobowl in White River Junction, used to book different performers every Friday and Saturday night. That’s a fresh outlook indeed, and when Naylor took over booking the music, he thought an open audition call of sorts might bring some variety to the venue. That’s the idea behind the “Shenanigans Battle of the Bands,” which began last week. Some of the area’s best stepped up – Sarvela, an AC/DC-inspired WRJ band won last week, and Stonewall battles D’brotherhood tonight. Next week Four of Clubs and Reality Check compete. The three first round winners meet in the finals May 24, and the winner gets a cash prize with a headline slot at Shenanigans on Saturday, May 26. “We got so many bands that we’re going to do a second one in June,” says Naylor. In the meantime, house bands are history, and one of Dennis’s favorites plays this Saturday. Conniption Fits features former members of Syd and the veteran area band Motorplant; their fine new CD, “Airplane Rides,” is getting airplay on more than a few area radio stations. There’s a vibrant area music scene happening, and it’s great to see Shenanigans back on board with it. Where the recent talk was, in Naylor’s words, “want to go to Shenanigans? No, they had the same band last week,” now there’s plans for even more local talent. Next month, the club is adding live music to the vintage car show they do every year. “It will probably feature one of those small local bands,” Naylor says. With his novel competitition to pick a Saturday band catching on, there could also be a lot more Thursday night rocking going on in White River. What else is shaking this weekend? Thursday: Falcon Ridge “Most Wanted Showcase, Middle Earth – Each year the Falcon Ridge Folk Festival has an all-day New Artist Showcase, where juried performers play three tunes apiece. The well-heeled audience then votes on the top three, who are invited back and are also featured on a pre-festival tour, which stops tonight in Bradford. Red Molly is an all-female three-piece with great harmonies, Ellis plays her own brand of spirited acoustic rock, and Pat Wictor is, simply, worldly wise. Friday: Pete Merrigan, Sophie & Zeke’s – It’s the long-awaited return of “Three Season Pete,” and can summer be far behind? He’s like “Cheers”with a beret – he knows everybody’s name. A word of advice – make reservations if you want to enjoy Merrigan’s happy-go-lucky blend of picking, singing and banter. Downtown Claremont’s favorite dining spot is sure to be packed for this one. Saturday: Soak, Heritage – A new band in the box at Charlestown’s favorite music spot, this time a Allman Brothers/Grateful Dead-inspired three piece from Manchester. You can listen to their stuff on MySpace (www.myspace.com/soaknh), but the real fun happens when Soak plays live. Look for a big Memorial Day party in two weeks at the under-new-ownership Heritage, with Sun King, Stonewall and the Highball Heroes – always a great time. Sunday: James Keelaghan, Boccelli’s – Recently, I failed to give this Juno-nominated songwriter credit for writing “Cold Missouri Waters,” done to perfection by Cry Cry Cry on their album, so I’m righting that wrong. Keelaghan has a great singing voice and a terrific catalog of songs, including “Jenny Brice” and “River Run.” He also did a nice cover on “Beautiful,” a tribute album to fellow Canadian Gordon Lightfoot released last year. Tuesday: Irish Sessions, Salt Hill – The musical circle in the center of Lebanon’s tavern on the green started and stopped in March. It resumes in earnest with the permanent trio of Chris Stevens on squeeze box, along with Roger Burridge and maestro/mainstay Dave Loney on fiddle. Anyone with a bit o’ talent can stop by and join in. A welcome return of an area tradition. Wednesday: Michael Civiello, Old Courthouse – The Colby-Sawyer music direction tickles the ivories every Wednesday at this elegant, understated Newport eatery. His sound doesn’t dominate the room, but it always enhances it. A bit of jazz and classical to accompany an inventive menu. Highly recommended.